Mary Meyers: The Iron Furnace, that's why the town was founded. It wasn't coal first, it was iron. But John Alexander and Phillip Tyson came from the state. They were engineers, topographical engineers, who came here, were sent to study the minerals in the mountains and streams, everything about, before any white people lived here. And they came here and they discovered that everything was here to make, needed to make pig iron. So they formed this George's Creek Iron Company. Well it later became the George's Creek Coal and Iron Company. But they started out with iron and they cane and built the Furnace. And this was the beginning of the town. And that was 1837 when they came here. So we celebrated the 200th Anniversary of the town, 150th I should say. So it's not that old really when you've been to Germany and Ireland and all those places where they talk about what happened thousands of years ago there. We're practically in our infancy. Gail Herman: So the pig iron started the town? MM: Yes. And they put up the buildings. They had to bring in workers because at that time there were no, there were few farmers living here in scattered areas. But there were no roads, no bridges and they had to ford the creek, and when the water got high, you know, it was difficult. So they had to make their own roads. They just had a wagon trail. So it was quite different. Then they had to have the farmers around built log houses for them. And they used the horses belonged to those farmers and then they would, they dug the coal. It was mostly out-cropping, like close to the outside of the mountains. They didn't go in very far at that time. They could dig without going in far and the same way with iron ore. And the stone used to build the furnace came from the quarry here. And they had this, the lime-stone they used to make the mortar and they made their own bricks from the local clay, there's plenty of water here. So everything they used they had lots of wood. So they had everything they needed right here. GH: And so when they fired the pig iron, or when they made the pig iron, what was actually the material they needed, from? MM: Well they made it from the iron ore and the coal. And the limestone. You've seen the furnace next door? MM: All right. It's open at the top. There's a, all down the center is open. There is a stack there and the furnace is built along the hillside so that they could bring the coal and the iron down from the hill to the top of the furnace, you see, because it went into the top. And they had a certain percentage, certain amount of coal, a certain mix, they had to have so much coal and so much iron ore and so much of other stuff. And then it had to reach a certain degree of heat and so it was quite a complicated operation. So Mr. Alexander brought people who were familiar with that work from the British Isles and from Germany. The stonemasons came from Germany and the iron and coal workers came from the British Isles at that time. And some coal, some miners were German. And then that was the beginning. They started a school. They all had church. From the very beginning John Alexander was very interested in religion. He was an Episcopal man and they always had church services every Sunday. They worked every day but Sunday and Christmas. The furnace worked every day except Sunday and Christmas. It was operated from, well they started to build in 1837 and then it started, they operated it from 1839 till 1855. And then that was all, it wasn't used after that. 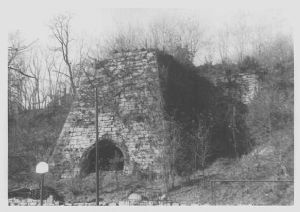 The photo of the furnace, taken in the early 1970s, is courtesy of Maryland Historical Trust. The basketball hoop and other play equipment belong to Central School which was located next to the furnace.